Democrat Barack Obama appears to have rebounded from some of the damage caused by the controversy surrounding his former pastor Rev. 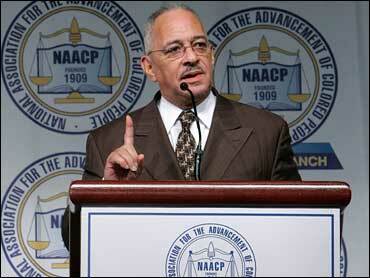 Jeremiah Wright, according to the latest CBS News/New York Times poll. On one key measure, Obama has seen a big reversal since his denunciation of Wright's remarks on Tuesday. He now leads presumptive Republican nominee John McCain in the hypothetical fall contest by eleven points, 51 percent to 40 percent. That compares to a tied match-up in a CBS News/New York Times poll that was released last Wednesday. Positive assessments of how Obama has handled the situation with Wright are also reflected by a continued lead over fellow Democrat Hillary Clinton in his battle for their party's nomination. Among Democratic primary voters (those who have voted or plan to vote in a Democratic primary) Obama's lead over Clinton has increased -- he now leads Clinton by twelve points, 50 percent to 38 percent. That's up from his eight point lead in the poll released just a few days ago. However, among all registered voters who identify themselves as Democrats (regardless of whether they have voted or plan to vote in a Democratic primary) Obama and Clinton are virtually tied -- 45 percent for Clinton and 44 percent for Obama. This is similar to the numbers earlier in the week. The poll also shows good news for both Democrats in a campaign versus McCain in the fall. Just like Obama, Clinton's lead over McCain has jumped, from 5 to 12 points. Independents back Obama in a head to head against McCain, but in a Clinton-McCain contest independents support McCain by five points. However, more Democrats say they will vote Clinton in the fall than say they will vote for Obama. The poll shows that almost eight in ten Democratic primary voters would support either Obama or Clinton against McCain in November. Among Democratic primary voters who support Obama now, 70 percent say they would vote for Clinton in November if she is the Democratic nominee. Among those who support Clinton now, 60 percent say they would vote for Obama if he is the nominee. This poll was conducted after Obama's public comments on Tuesday denouncing Wright's statements, something most voters think he handled well. Democratic primary voters are especially approving. By a margin of nearly three to one, registered voters who have heard about the situation approve of how Obama has handled it, with 60 percent approving to 23 percent who disapprove. Among Democratic primary voters, the margin is 68 percent to 22 percent. Just over half of registered voters say Obama has been appropriately critical of his ex-pastor. But one in four voters (and slightly more Republicans) would have liked him to have gone further in his rejection. However, 47 percent of voters see political motivation as the main reason behind Obama's decision to renounce his minister. Fewer, 34 percent, think the split came mainly because Obama disagreed with things Wright said. A large number of voters - three-quarters - say that what Wright has said has not changed their opinion of Obama. However, Wright has caused 24 percent to change their view, with 22 percent saying their view of Obama is less favorable. Republicans are more likely than Democrats or Independents to describe the Wright impact negatively. Favorable views of Obama have rebounded some in this poll compared to earlier in the week when his ratings had dipped in the days after Wright's recent speeches. Forty-four percent now say they have a favorable view of Obama, compared to 39 percent on Wednesday and 43 percent back in March. His negative rating is 30 percent now, compared to 34 percent on Wednesday and 24 percent in March. When voters are asked about their support for Obama as a candidate, the impact of the Wright situation is again negative -- but limited. Seventy-three percent say say it has not changed their likelihood of voting for him, 18 percent say it makes it less likely and six percent say it makes them more likely. As with personal views of Obama, it is Republicans most likely to report a negative impact. Most voters also say they do not expect Wright's impact to linger in their own minds. Only about one in ten say this will affect their November vote a lot, with 73 percent saying it will not affect them at all. The impact appears strongest, however, among Republicans, who are least likely to vote for any Democrat. However, some perceptions of Obama's qualities have shifted in the last few weeks, and he has lost his edge over Clinton on some past strengths. He is behind both Clinton and McCain on the question of who is tough enough to make the hard decisions a president must. Seven in 10 think both Clinton and McCain are tough enough to make the right decisions a President has to make. Fifty-eight percent say this about Obama. But more voters, 52 percent, view Obama as the candidate who would unite the country. Slightly fewer now say this about Clinton and McCain is the weakest on this characteristic. Obama has gone down in this measure from February when 67 percent said he would unite the country. No candidate now has a clear lead when it comes to the candidate who shares the values of most Americans. Sixty percent now say that Obama shares the values of most Americans, but this is down from 64 percent last week, and from 70% a month ago. Four in 10 of those who do not think Obama shares their values say their opinion of Obama has been negatively impacted by the Wright controversy. And most of these voters say Obama distanced himself from Wright for political reasons and not because he really disagreed with his statements. The poll also asked voters about their opinion of lifting the federal gas tax over the summer, a proposal supported by McCain and Clinton, but not by Obama. Forty-nine percent think lifting the tax is a bad idea, while 45 percent approve of the plan. Most Republicans approve of the idea and most independents disapprove, while Democrats are divided. Americans are also divided on this issue by income: Americans making under $30,000 a year approve of a gas tax "holiday" for the summer, but most Americans making more do not. The poll also found that many are skeptical of the motives of the public figures that support the idea of a temporary lifting of the federal gasoline tax: seven in 10 think they support the measure mostly to help themselves politically. Even most Americans who approve of the idea think so. In this poll, Clinton is the candidate most viewed as pandering: Just 34 percent think she says what she believes, while nearly two in three believe she says what people want to hear. For both Obama and McCain, just over half say they say what he believes and four in 10 think they say what voters want to hear. The debate over the gas tax comes as America's view of the condition of the national economy reaches new lows. According to the poll, 83 percent think the condition of the national economy is bad - the highest number recorded by the CBS News/New York Times poll since this question was first asked in 1986. Only 16 percent say the economy is even somewhat good, also a record low. The view of the condition of the economy has dropped six points since last week, and it has dropped 22 points since the beginning of the year. Lastly, the poll found that President Bush's job approval rating remains at 28 percent, the same as on Wednesday. Mr. Bush's approval rating has not risen above 30% in over a year. This poll was conducted among a random sample of 671 adults nationwide, including 283 Democratic primary voters, interviewed by telephone May 1-3, 2008. Phone numbers were dialed from RDD samples of both standard land-lines and cell phones. The error due to sampling for results based on the entire sample could be plus or minus four percentage points. The error for subgroups is higher. The error for the sample of Democratic primary voters is five points.